Pulmonarias have a long history in European gardens and are easily recognised in spring by their spotted leaves and pink and blue flowers on the same plant. There are pulmonarias in most gardens, and now is when they are at their best - the perfect foil for spring bulbs, neat clumps of foliage and abundant flowers that provide an important food source for pollinating insects. Ideal garden plants, they are hardy and easy to grow, and one of the few plants with silvery or silver spotted leaves that thrive in shade. Flowers open in succession over several weeks from pink or red buds and as the flowers mature they become violet, blue or purple although some plants bear flowers that remain pink or red and others are almost pure white. The variation in foliage and flower colours range from vibrant electric blue with a foil of plain green leaves to subtle shades of pink and white with softly spotted or blotched leaves. Pulmonarias is the latest in the HPS range of booklets and provides guidance on the best varieties to plant and how to grow them well. Margaret Stone has revised and updated Jennifer Hewitt's original text and added colour photographs throughout. 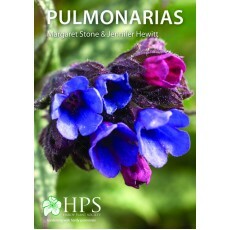 Launched at the Pulmonaria Group's annual lecture day last month, it is now available to buy from the HPS website. 1 Comments To "Pulmonarias Booklet Launched"